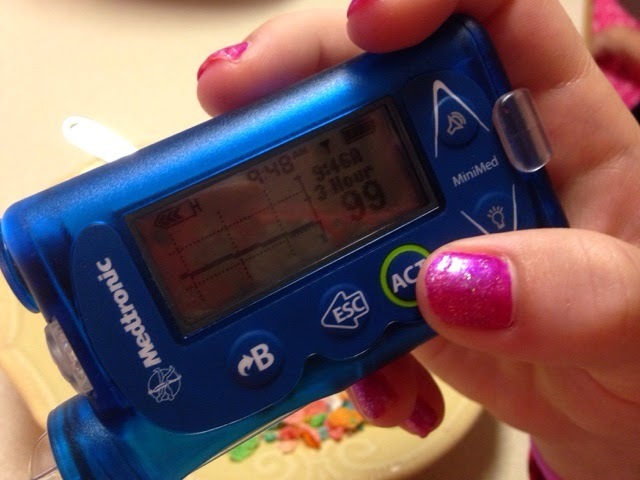 Oldest daughter has been enjoying her Medtronic 530g for about nine months now. 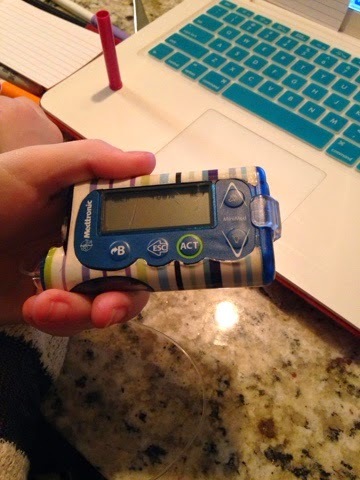 While she likes many of the features; from the simple bolus process to the ease of changing an infusion site, the number one feature that she absolutely adores is the ability to add new personalized vinyl skins. Who doesn't like a pretty insulin pump? To date, she has used just two skins since July. Due mostly to the fact that they are very durable and unless you desire a decor change, the skin lasts indefinitely. Another nice feature is how the skin also offers protection from accidental scrapes and bumps. When oldest daughter removed her first skin, the pump was virtually brand new - whereas other technology that she wore was scratched from day one! Today, oldest daughter is wearing a cute striped skin in her coveted shades of blue to match her favorite jeans and sweatshirts. The edges are pulling up just slightly from many months of wear using only a pump clip on her waistband. In a pouch, that wouldn't happen at all! Previously, oldest daughter created a cool soda skin in her favorite flavor. One of her friends opted for a picture of her kitten as she named both her pump and the cat, Bella. She explained that she wanted to be able to have a good feeling when she looked at her pump because it was much like a pet with the attention she gave it. Anything goes as long as it looks cute! To tie in a fun diabetes "skin" reward, you may choose to set a T1d goal with your child. When you meet the goal, you and your child can visit medtronic.skinit.com to see all of the neat possibilities or to upload a personalized design. I should warn you first, there are literally hundreds of awesome designs to choose from. It may require a while to look through all of them. Oldest daughter wanted to customize it with one of her favorite items and we thought it might be fun to share with you when it arrives in a few weeks. Skin-it also offers other skins for laptops, phones, iPads and tablets. Someone ambitious could actually coordinate their entire media/medical devices for a very stylish look. No matter what you choose, nothing can replace the good feelings of adding a fresh new look to your external pancreas. As oldest daughter picked out her new design she said, "Those healthy pancreases are sad in their pink skin- they never have anything pretty like this! I'm calling it a T1d perk!"